To keep your dentures and mouth in good shape, we sell a number of different professional products at our clinic. For more information on products and prices feel free to call the clinic. Aids to help moisturize mouth when mouth feels dry. Many patients experience dry mouth due to being on certain medications - this relieves these symptoms. Aids in cleaning Dentures and removing built up plaques through vibrations. Our favourite professional denture cleaner. 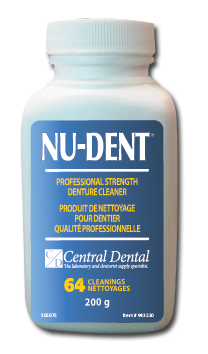 NuDent is a lot stronger and more effective than over the counter denture cleaners. This denture bath is stylish and efficient because it uses sonic waves to loosen build ups on dentures.